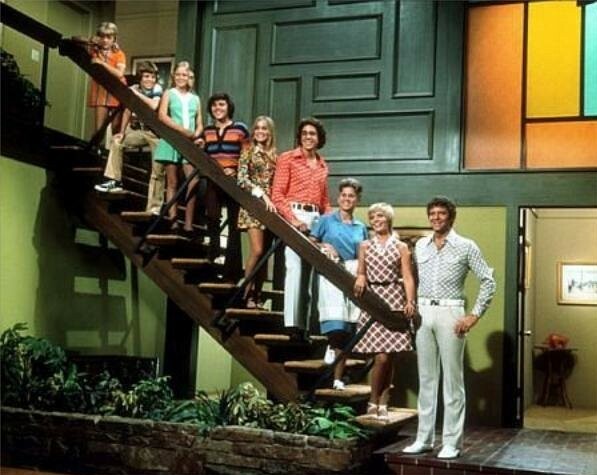 The series was never a huge hit and was cancelled after five seasons on ABC, but The Brady Bunch has become one of the most successful sitcoms in television history. There have been multiple spin-off series, TV movies, feature films, cartoons, and even a stage play that recreated original scripts. Well, the Bradys are back once again — this time in an original musical. Though A Very Brady Musical is being executive produced by series creator Sherwood Schwartz, it’s not a version of the Brady clan that you’ve seen before. In the story, Mike and Carol are frustrated that they never have enough private time to make love. The kids overhear their parents arguing and suspect they might be heading for divorce. As a result, the six siblings put their heads together to raise money for some marriage counseling. Greg operates a car service, Marcia dates for money, Jan and Peter put on magic shows, and Bobby and Cindy look for money in couches. At the same time, wacky housekeeper Alice somehow gets accused of fraud! Can you imagine the Bradys in a holding cell at the local police station? All set to music? The musical’s all in good fun but admittedly isn’t intended for very young viewers. It’s more of a satire, in a similar tone to 1995’s The Brady Bunch Movie . The team behind A Very Brady Musical is the same one that created the popular Gilligan’s Island: The Musical. The script was written by Sherwood’s son and frequent collaborator, Lloyd, and Sherwood’s daughter, Hope Juber. Music and lyrics were written by Hope and her husband, Laurence Juber. Lloyd is directing the production which is debuting at Theatre West in Los Angeles. 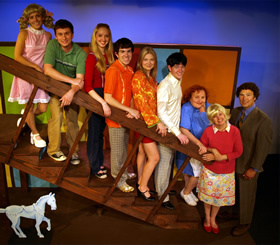 The cast includes John Cygan and Barbara Mallory as Mike and Carol; Elliot Kevin Schwartz and Erin Holt as Greg and Marcia; Justin Meloni and Laura Marion as Peter and Jan; and Adam Conger and Kelly Stables as Bobby and Cindy. Kathy Garrick plays Alice and Matthew Hoffman, Selah Victor, Roger Cruz and Mary Garripoli play other characters in the show. If A Very Brady Musical was playing in your area, would you see it? Of special note to TV history fans: Cygan was a regular on the 1990s Bob Newhart sitcom, Bob; Mallory has had parts in several Brady and Gilligan’s Island reunions and is also Lloyd Schwartz’s wife; and Elliot Kevin Schwartz is Lloyd’s son and a veteran of multiple Los Angeles theatre productions. A Very Brady Musical kicks off tonight with a special gala function that will be emceed by Christopher Knight (Peter from the original Brady Bunch series). Tickets are $60 for the opening night gala and $15-40 for regular shows. Theatre West is located at 3333 Cahuenga Blvd West, in Los Angeles and tickets can be ordered by calling (323) 851-7977. The production runs until July 20th. If you don’t live in Southern California, there unfortunately aren’t currently any plans for other productions. Still, if past Brady success is any indication, it seems likely that A Very Brady Musical will eventually find its way to a theatre near you. Stay tuned! A musical????? I Think I’m going to be sick.